Indians are used to dealing with a lot of extremes – temperatures, poverty, crowding, the latest is smog. India has long been known for its poor air quality, (14 of the world’s top 15 most polluted cities are in India, according to the WHO) but this past month, residents of New Delhi were exposed to up to 24 times the safe level of air pollution. The pollution has driven student activities indoors and even caused the Supreme Court to put restrictions on fireworks for Diwali, the widely celebrated festival of lights. Doctors fear that these levels will cause many more premature deaths, especially in young children. In other countries in Asia, when people see that the air quality is poor, they tend to wear masks, but most Indians do little to shield themselves from the poisonous air. Diwali took place on November 7. As one of the most highly anticipated festivals in India, people everywhere light candles, adorn their houses with lights, and of course, set off fireworks. This year, however, the Supreme Court decided to only allow fireworks to be set off during a 2-hour period and declared that only ‘green’ firecrackers could be used, though none are for sale in the Delhi area. Unsurprisingly, few took heed of the restrictions, and Diwali went on as usual, with thousands of fireworks being lit at all hours of the night. The next day, pollution levels were higher than ever. In winter, air quality tends to get worse because of higher levels of humidity in the air, lower temperatures, and light seasonal winds. Farmers also customarily burn stubble to prepare for the winter crops, though the Government has offered incentives for them to stop this practice. They were offered machinery subsidies to turn the stubble into mulch instead of setting it alight, but many farmers claim that the money isn’t enough to operate the equipment and hire extra hands to assist in the process, so most continue to burn, which releases tonnes of toxic fumes into the air. Last year, the air quality got so bad that the Delhi city government declared a state of emergency, but Narendra Modi’s Bharatiya Janata Party is not showing the political will to take the drastic measures necessary to improve the worsening air. There’s more focus on farmers’ wages and oil prices. 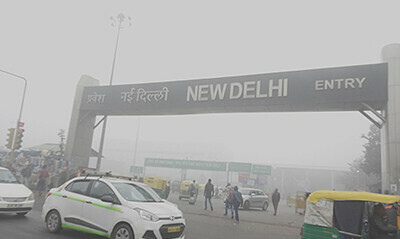 The Environmental Pollution Control Authority suggested taking personal vehicles off of Delhi’s roads, but most see that as an outlandish idea. More Indians are wearing masks and staying indoors, but many still operate with a business-as-usual mentality. Some who are wealthier can afford to buy air purifiers, but they only work properly in a completely sealed environment. The adverse effects of poor air quality on heart and lung health are well established in the scientific community, but a more recent study found that exposure to toxic air can affect cognitive ability as well. This is especially concerning for children, whose brains and bodies are still developing. It seems that these days, everything’s a crisis: wildfires in California, the rise of radical nationalism, prolonged wars and their forgotten victims. It’s difficult to keep track – difficult to prioritize the risks whose consequences are deferred. Air pollution gets worse every year around this time in India. People have got used to suffering – when it’s a little bit over a long period of time, it’s hard to notice the damage. There are so many things that shave years off of our lives – air pollution, undeclared food additives, sitting too much, etc, and therefore, the more immediate requirements of daily life take more of our attention. Public awareness about a problem can go a long way toward fixing it. Air pollution does not discriminate; the rich and the poor alike must breathe air to live. It’s time both came together to demand that more be done, by civilians, farmers, and the Government, to make India’s air breathable again.